I have always been a little overweight, with the exception of my first year of college. For reasons that I don't remember, I decided to be a vegetarian and lost a bunch of weight when I was a freshman. Then I met my now-husband the following summer, and started to put the weight back on over a period of almost 9 years. 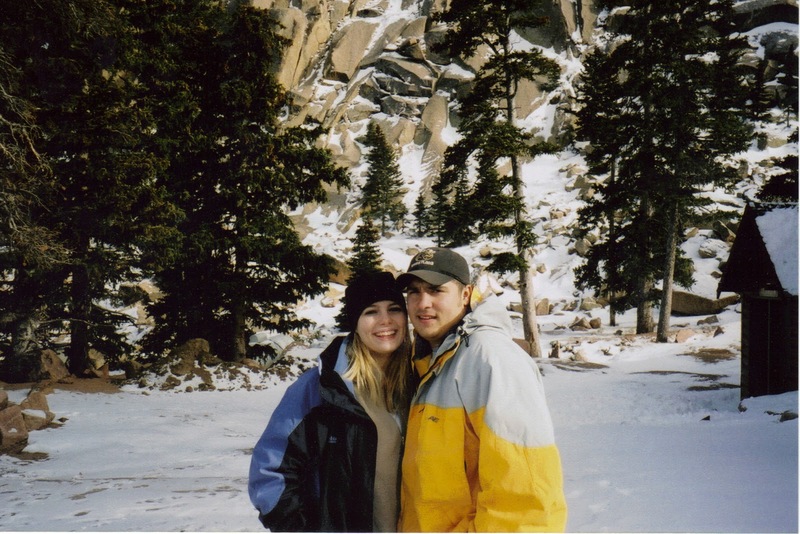 This is a photo from November 2003, when I took Patrick to meet my Dad & step-mom who were living in Colorado at the time. I think I was a size 8 then. Now, many sizes higher and many years later...I have decided that losing weight needs to be something that I challenge myself to do. My 10 year high school reunion is coming up, and I would really like to be smaller NOW than I was THEN. For the past three weeks or so, I have been calorie counting. Meaning that everything I eat, gets "wrote down" to monitor how much I eat each day. This really allows me to feel that I am not really dieting. I can still eat what I want, but just in moderation and UNDER a certain calorie amount. Thanks to an APP that a friend recommended, I have been using MyFitnessPal. Its completely FREE for any smart phone owner. I have a Droid. You can even just use the program on your computer...you don't even need a smartphone. And what it does is helps you keep track of everything, from how many glasses of water you drank, to snacks, to meals, and even when you exercise. Simply do a quick search for what you ate for breakfast or lunch, and it will provide you with several options to choose from. I absolutely LOVE it! It even says what your goal weight will be if you eat healthy, exercise after each day. And for me, I challenge myself to eat less, then reward myself later. That is my motivation for now. Or if I eat something not so good, I can use our "new" treadmill (that our Aunt gave to us - Patrick picked it up last week) to get rid of all those bad calories. I would highly recommend anyone who doesn't like to diet/exercise, to try this APP/program. Or for anyone who is just curious about how much you eat everyday. I was very surprised by how much I actually eat each day...its crazy how many calories are in what you eat/drink. Like a slice of cake, or a even your fav. piece of pizza. Sigh...I will have to start saving those for special occasions. Are any of you trying to lose weight? Tell me, what has worked for you? What is your motivation? I am thinking I need to go buy a little black dress in size 8...and hang it up by the treadmill. What do you think?